Consumer psychology is all the hype at the moment as an increasing number of marketers are driven to understand why consumers make the decisions they do. But what exactly is subconscious marketing? And how is it relevant to your job as a marketer? These are important questions to ask. By becoming aware of how the subconscious mind drives behavior, you can better understand what makes your customers tick. And equipped with this knowledge, you can rest assured that your campaigns are not in vain and result in conversion. What exactly is the subconscious? For a visual explanation of the subconscious, let’s turn to the, although at times a bit questionable, Sigmund Freud. Freud argued that your mind resembles an iceberg, which is split into three distinct parts. 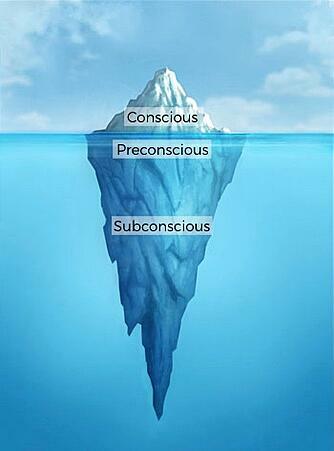 The visible tip of the iceberg represents the conscious mind. Decisions from your conscious are result of willpower or logic. For example, explicitly thinking about what you will cook for dinner or solving a complicated math problem. Beneath the tip and just within reach of the surface is the preconscious mind. The preconscious is made up of information that you know and can access, like your mother’s birthday, but might not be actively considering. The most substantial part of the iceberg that plunges deep into the water represents the subconscious. The instinct for survival and emotions drive this area of the mind. And these instincts, in turn, prompt conscious behavior. Neuroscientists found that decisions are made in your subconscious mind far before you are consciously aware of it. This explains why people will often say one thing (i.e., have a conscious thought) and do something completely different (i.e., subconsciously behave). Auto-pilot simply takes over, sometimes preventing you from noticing that your behavior contradicts your words. This (partly) explains why so many diets fail. Someone will swear off junk food. But as they stand in line at the grocery store, they look down and find that beckoning bag of chips staring back. And suddenly, contradictory behavior is triggered. This person may have been exposed to different aspects of that chip brand’s marketing throughout their day or grocery store visit. Their subconscious picked up on these environmental cues and prompted behavior without the conscious realizing what was happening. These automatic (for system 1 for Kahneman fans out there) responses help us in times of trouble. Like when there are so many choices and the anxiety of choice overload sets in (more on Choice Overload here). Visual cues that trigger out subconscious decision-making process, help make decision-making easier. It happens to the best of us. And I mean it, it doesn’t matter how far your persuasion knowledge goes. It can happen to anyone. Don’t believe me? Check out Derren Brown’s brilliant stunt with two persuasion kings. What makes adjusting marketing efforts to trigger subconscious decision making even more compelling is the impact it has on emotions. Neuroscience research shows that when your subconscious identifies a way to fulfill a goal, it will produce a positive emotion. This, in turn, triggers a decision to reach goal fulfillment. The same goes for when it identifies something that will prevent goal fulfillment. A negative emotion is created, and a decision to avoid the behavior occurs. If your brand's message successfully appeals to a person's subconscious emotions, their behavior will be nudged in the preferred direction. But keep in mind, there is no "one size fits all" approach to this. Everyone is different and is attracted to different psychological principles. In-depth research into your target group and experimenting with various psychological approaches is often the only way to find the most suitable approach. There are countless examples of marketers using subconscious triggers to their advantages. From a decision as simple as using specific colors to prompting behavior with goal-fulfillment driving copy, speaking to the subconscious is not a new trick in the book. 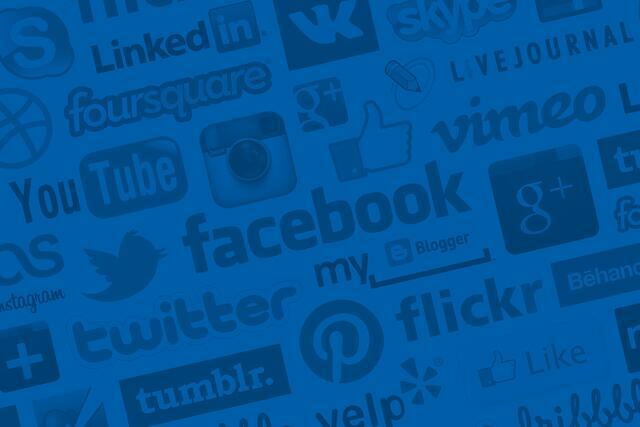 Have you ever noticed that many of the social media platforms use the color blue? Well, it’s not entirely a happy coincidence. Sure, Twitter uses blue to symbolize a blue sky to match their bird. And Facebook founder Mark Zuckerberg is red-green colorblind, so blue was also a natural choice. But, “luckily” for these brands, blue means more than just an practical fit. This color is known to symbolize comfort, trust, and most importantly, communication. This color works for many companies because it is a welcoming color that portrays it is both safe and reliable. Plus, it is not too present and can easily fade into the background when the viewer switches their attention to certain information. Every color in the rainbow can invoke different emotions or drives. It's just a matter of defining what tone you want to set in the minds of your audience. If you want more information on how colors affect buying behavior, check out this post on applying color psychology on websites. There's a lot going on behind the scenes when you're exposed to a price. The price of a product can ask as many things, an indication of quality, reference point or anchor, sign of a good deal. Take the example of expedia.com, and virtually every other travel booking site, above. As the page "loads" you see prices that start very high and slowly decrease. This approach "anchors" you on the first price, so by the time you get to the last, you think to yourself, "Score!" By starting with inflated and unrealistic prices, you are primed to be more satisfied with the resulting best deal. There are many pricing techniques out there, all of which serve a different purpose to drive decision-making and behavior. Check out this blog post for our review of the pricing theories. Trust symbols can go a long way, especially when it comes to shoppers who are on your site for the first time. They instill a feeling of trust and are absolutely essential in combatting shopping cart abandonment. Whether the shopper consciously looks for these symbols or is subconsciously reassured, they offer the needed security. We live in an era where data protection is taking a predominant role in society, which is why sometimes a little goes a long way. 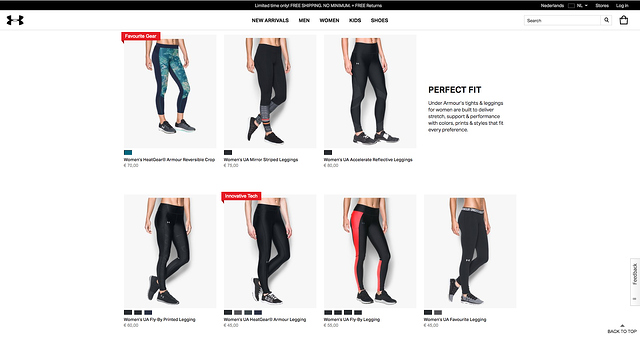 One of the more recent approaches to appeal to the subconscious is through the use of persuasive marketing triggers on webshops. These micro-copies stem from behavioral psychology persuasion principles that have been found to increase the likelihood of marketer-desired behavior. They reduce the psychological strain your visitors experience while shopping (more on that here). In the example above, there are several persuasive triggers. First, in the top black bar, it states, “Limited time only, free shipping, no minimum, free returns.” This technique comes from the scarcity principle. Meaning that when individuals feel that their opportunity to reach goal fulfillment is limited, they are driven to act. The “Favourite Gear” tag is derived from social proof. People often look to the behavior of others to determine their own behavior. Social proof copy drives people to believe that if others love this product, they will most likely also love it. Finally, the “Innovative Tech” tag drives people’s behavior through the belief that the product is new and cutting-edge. Individuals are evolutionarily programmed to seek innovation, so speaking to that early adopter desire can encourage action. Crobox's Persuasion Profiling framework uses this approach to discover brands' unique consumer insights. We've found that each principle appeals to individuals in a different way. One person who may be susceptible to social proof may shy away from the use of the scarcity principle, and vice-versa. The use of these principles requires experimentation. 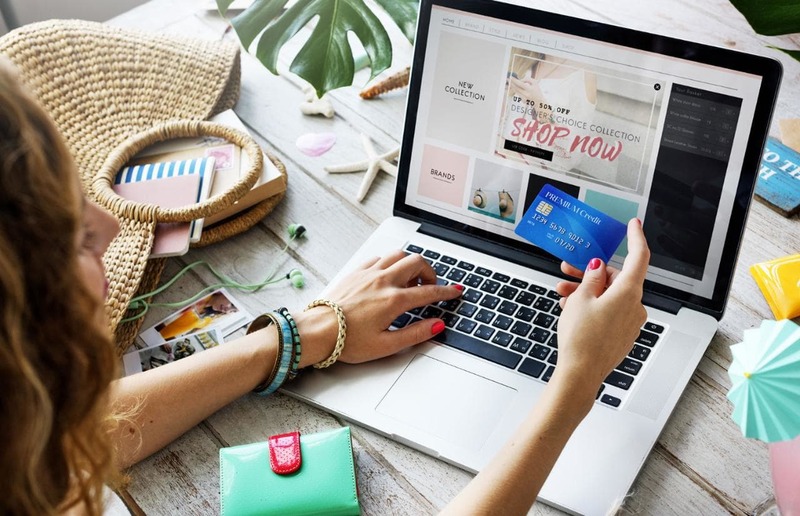 But fortunately, what makes this approach ideal from a testing perspective is that its effects can be measured in real-time through a webshop’s analytics. Check out this blog post for 16 marketing trigger examples. Consumer psychology is making a comeback in modern marketing. Keeping ahead of the curve will allow your business to stay competitive and reap financial rewards. By investing the time and energy in learning more about the psychological drives of your consumers, brands can better understand their customers and lead campaigns that resonate with their audiences. Just keep in mind that when appealing to the subconscious, the methods in which you test must adapt to the idea that subconscious behavior and conscious intention differ. Check out this blog post for more information about ways that you can experiment with to collect behavioral data and see the impact of your strategic choices. Want to find out how you can use various persuasive techniques to drive behavior on your enterprise's webshop? Download our Trend Report!